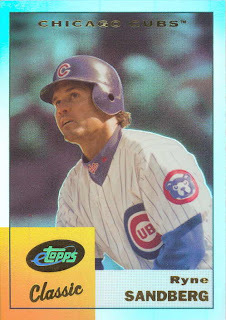 The Etopps program was on its last legs when I got back into collecting, and by the time I bought my first card, the program was for all intents and purposes dead. It took over half a year to get that initial card of Darwin Barney. During the wait, Topps announced that they were not going to produce any new Etopps cards. There has hardly a peep out of collectors. ....of Ryne Sandberg. Its a nice refractor type card and its got an official Topps sticker on the back. But otherwise, bah. So long, Etopps. We hardly knew 'ya and we won't miss 'ya. I Really Wanted Rich Hill's Autograph, Really! 2002 Team Issued Set COMPLETE!! What's On Shawon Dunston's Arm? ?